“When it comes to the safety of these people, there’s me and then there’s God, understand?”. 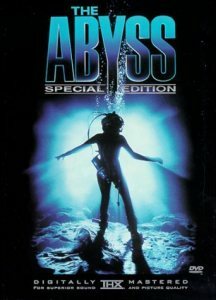 Exciting underwater adventure about a diving team that encounters an alien aquatic species while searching for a lost nuclear submarine. Ed Harris leads a solid cast in this incredibly entertaining movie from writer/director James Cameron. There’s plenty to enjoy here; great sets, first rate action scenes, and an edge of your seat finale (though the ending left me wanting more). Hang on! Note: Extended edition runs 171 mins. Fun fact: “Cast members had to become certified divers before filming began”. ouuff what a movie! i’ve watched like 2 times only on TV and i enjoyed every second of it! the effect back at the time were g8 and even to this day they are top notch. Now all i have to do is pray for a Bluray release. btw it reminds me another movie: Sphere.